With her good looks and feminine charm, Anita Lee (李婉華) became a television staple in many TVB productions shortly after her showbiz debut in 1988. Although her career with TVB was only a short five years, she starred in many popular works, such as Everybody Loves Somebody <公私三文治>, The Gods and Demons of Zu Mountain <蜀山奇>, and One Step Beyond <老友鬼鬼>. With the current rebroadcast of the sitcom Family Squad <卡拉屋企>, viewers noticed how Anita still looks great compared to almost 30 years ago! Anita met and starred alongside Francis Ng (吳鎮宇) while filming Everybody Loves Somebody in 1989. The couple began dating for the next eight years before calling it quits. Later, Anita moved her career to ATV, where she began dating Kenny Ho (何家勁) in 1998 while filming Master Ma <馬永貞之英雄血>. In 2001, Anita began dating stockbroker, Leo Lee (紀李守正). She retired from the entertainment industry after tying the knot with Leo in 2003. The couple have three children – one daughter and a set of twin sons. The 50-year-old former actress made a brief return in 2018 and guest starred in the TVB drama, Another Era <再創世紀>. Netizens were surprised to see that Anita has kept up her looks and her figure. 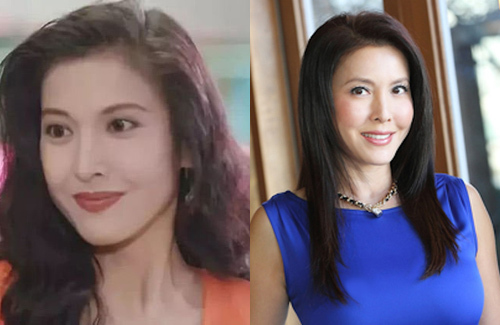 Similar to the likes of Gigi Lai (黎姿), Kathy Chow (周海媚), Chingmy Yau (邱淑貞), and Athena Chu (朱茵), to name a few, Anita is another one of Hong Kong’s ageless beauties! I wouldnt say ageless. You can tell she is older, but she looks good for her age. I actually didn’t really pay any attention to her until i watched this mainland series called “Love Talks” or 真情告白. I found her super stunning in that one. Even at her age now, she still looks fantastic. Some people find it glorifying to be considered a goddess, but I think it’s kind of a burden title. Even when you age, you can’t just age. You have to keep up your age. They can’t turn into ahjummas or else face public derision. Must be hard. @m0m0 wow, really? so you haven’t watched any mainland dramas since? 真情告白 was probably one of the first mainland drama i’ve ever watched that i was able to finish from start to the end. to this day, i don’t know any modern c-drama that was able to match its coherency and keep my interest. ancient c-dramas are another story. Her smile looks very stiff. Definitely too much botox. @jimmyszeto Anita was one of those rare actresses who had both looks and talent, so I always felt it was a shame she retired from the business so early…but hey, she’s happy and that’s what counts the most! “Everybody Loves Somebody” was one of my favorite sitcoms (man, I miss all those 80s/early 90s era sitcoms – every single one of them was good!!) – loved Francis in there and his pairing with Anita was so sweet! I liked Family Squad too, but I felt their pairing in that sitcom was a bit forced and therefore less natural — though not surprising of course, since that was what typically happened when a celebrity couple in real life would work together in the same production…this is why I feel it’s wise that many celebrity couples usually refuse to be in the same series / movie together after they start dating and/or get married. For me personally, the only couple I loved seeing onscreen together even after they started dating/got married was Michael Miu and Jamie Chik – I don’t know how to describe it but the two of them have this awesome chemistry together that always translated well both on and off the screen….I never got tired of seeing the two of them together. Anyway, back to Anita and Francis — I actually forgot that they had dated for such a long time (8 years!). Back then, the 2 of them were such a popular couple off-screen and I always felt they were super compatible (both seemed to have similar temperaments personality-wise…Anita could definitely match Francis in that area) — which is why I was completely shocked when they broke up in the mid-90s. I remember when TVB did that wedding special for Alex Man and Kelly Tien (another celebrity couple that eventually went separate ways), both Francis and Anita participated in the festivities and the guys kept teasing Francis, telling him to pay attention to everything so that he would know what to do when he and Anita got married, lol. Oh and the time when Francis and Deric Wan were filming “On the Edge” and everyone kept teasing him about Anita visiting the set and bringing him soup….another sweet moment, haha. I obviously shipped them as a couple back then and yes, I was saddened when they broke up, but it’s great to see that the 2 of them remained good friends still (which is also rare in the entertainment industry). I have watched family squad but not ‘everybody loves somebody’. It’s a mess about sitcoms that’s always welcome to chill out to after a hard days work.Yeh. Michael and Jamie Chik were amazing together. When I watched their 1st series together probably slightly more than a decade ago, I was obsessed with Jamie’s natural beauty for a while. Haha!!! I’ve met her over 30 years ago in Toronto. She and the late Jacqueline Law scared me off when they kept jabbering about brand name handbags and stuff.